Simpleview has been named the exclusive “ROI Champion” of the International Congress and Convention Association (ICCA). The designation distinguishes Simpleview among an elite group of global business partners working with the organisation to increase and showcase the value of ICCA membership. As ROI Champion within the ICCA Business Partnership programme, Simpleview will collaborate with ICCA on member education and activities focused on technologies and best practices for managing, analysing and reporting the return on investment (ROI) of ICCA’s tools, activities and data. At the upcoming record-breaking ICCA Congress in Dubai, with now over 1,100 delegates from over 75 countries registered (a record for any ICCA Congress outside Europe), Simpleview sponsors the Business Exchange – a targeted speed-dating session in which ICCA members share information on international association meetings. The ICCA Business Exchange session is at the core of ICCA’s global association meeting community. In this session, ICCA member suppliers that have hosted an international association meeting share background information on its decision-making process, key decision-influencing factors and other tacit knowledge, to optimally prepare their fellow members to successfully bid for future editions of these meetings. 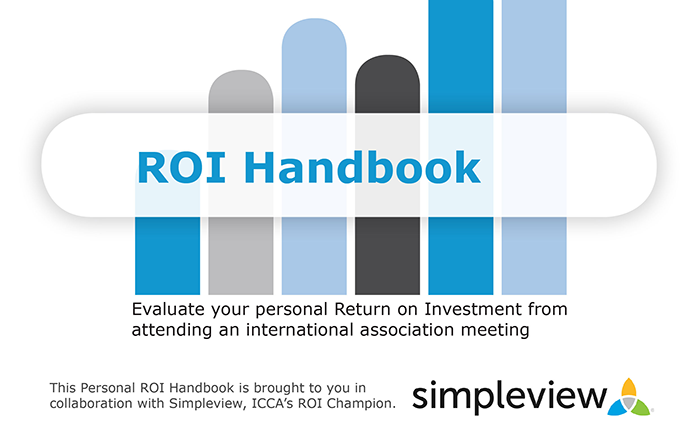 Simpleview also sponsors the ROI handbook and workbook, which ICCA has designed to help delegates identify and maximise the benefits they gain from attending meetings, congresses and tradeshows. This online PDF document provides a detailed explanation of how each delegate can maximise their personal ROI, setting out key concepts but also providing practical advice and checklists. It is publicly available in ICCA’s Knowledge Hub. Through the partnership, Simpleview will showcase the ways a CRM helps organisations manage business opportunities and report ROI and economic impact. Educational opportunities will include cross-participation in events and initiatives for both partners. Additionally, Simpleview and ICCA will collaborate on ideas, refine best practices to be shared through ICCA member communications and its Knowledge Hub, and co-develop new products that will enable organisations to better recognise and report on the value of ICCA membership. From the launch of Simpleview CRM nearly 20 years ago, Simpleview’s products and services have continuously evolved with a laser-focus on streamlining business and delivering value for destination marketing organizations in a complex and rapidly changing environment, said Richard Reasons, President of Simpleview and ICCA Board member. “We understand how critical it is for these organisations to truly understand the impact and value of their efforts for their local economies, employment, education and innovation. We help them manage those efforts and provide the tools to measure and communicate the ROI message to their stakeholders,” Reasons said.